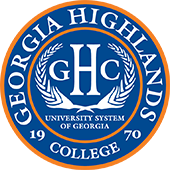 Georgia Highlands College is a multi-campus, state college member of the University System of Georgia. Founded in 1970 as Floyd Junior College, it now serves more than 6,000 students in Northwest Georgia and Northeast Alabama across its five locations in Rome, Cartersville, Marietta, Dallas, and Douglasville. GHC currently offers over 30 areas of study with associate degree and bachelor’s degree options both in the classroom and online. GHC is proud to support the local economy with a regional economic impact of nearly $150 million. © 2019 Georgia Highlands College. All Rights Reserved.